At the half way stage of the Surrey League Cross Country League, Walton continue to dominate the U15/17 age group. After narrowingly losing out to South London Harriers in the first fixture at Richmond Park by 8 points, Walton were out to regain first position in the second fixture at Wimbledon Common. They certainly did not let themselves down with club captain Ben Fitzpatrick wining the individual race, followed home by Ollie Emment in second, and with another three Walton athletes in the top ten easily secured the team victory. So after two of the four fixtures the U15/17 boys are in first place ahead of South London Harriers. In the under 13 Boys competition, Walton struggled in the first fixture due to non availability and with only two athletes competing ended up in 9th place. But with a much better turn out in the second fixture the team ran their socks off to take 5th place. At the halfway stage the under 13 Boys are in 5th place out of 15 teams. Well done to all the boys who have competed in the league so far this season especially newcomers Friso Kolff, Charlie Davidson, Stephen Smith & Lucas Williams and to club captain Ben Fitzpatrick for his amazing pre race speeches. The third fixture takes place in January at Mitcham Common. 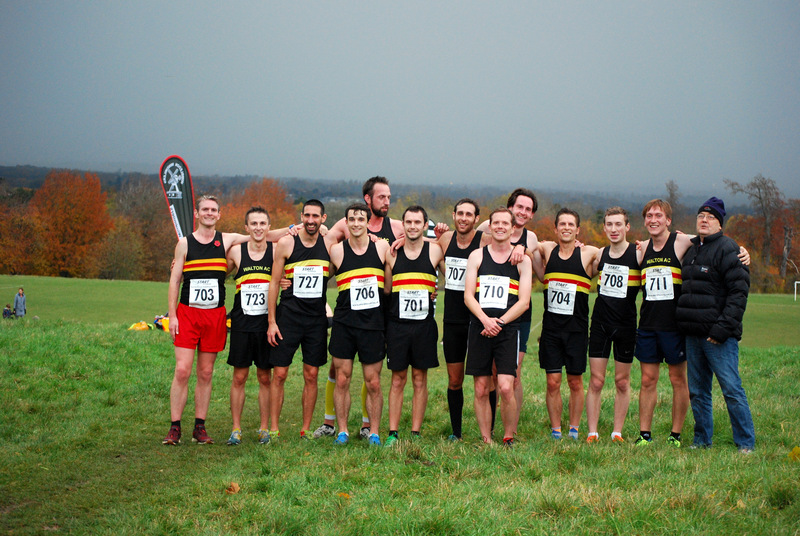 Meanwhile, in spite of the paper team suffering due to absence, injury, or recent marathon runs, superb runs from Hugo Fleming and Andrew Crooks saw the men’s team place 6th on a winding and undulating course at Nork Park, and lying 7th in the division with only a handful of points separating Windmilers ahead and Croydon behind. Hugo came in 10th and Andrew 13th in a field headed by GB international Andy Maud. The rest of the team collectively made up huge points with strong second laps, Duncan Woolmer ultimately placing 29th. A three-way scrap between Chris de Mauny (53), Jon Ladley (56) and Rob Lovegrove (58) saw them all rise up the field in the second lap, with Matt Pharaoh heroically holding position ahead of the three in 49th. Matt Reed and Rob Marcus followed, both recording steady runs for 73rd and 77th, with the ever dependable Chris Ness closing out the team in 85th. Rob Smith and Adam McCarthy provided valuable backup. In the SLCCL at Nonsuch Park, a handful of girls tackled the flat but technical course, the thin layer of mud created by the previous night’s deluge nicely cut up by the record-breaking division 2 senior race at 11am. Bella Wiles and Eloise Williams were 13th and 29th in the U15 race, while Imogen Burton was 6th in the U17. For once, the seniors outnumbered juniors, and the near-complete team of Lizzie, Mandie, Guillaine and Armanda were clobbered by the 308 penalty points for the incomplete team, to finish 22nd, in spite of strong runs. The next fixture for the women is in February at Richmond Park, while the men will race with the boys in January at Mitcham Common.